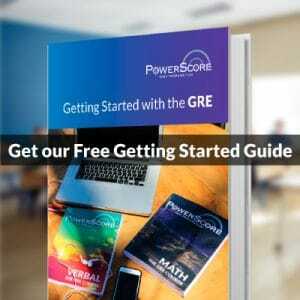 As we’ve discussed previously, one key to success on GRE Quant is to remain engaged with the problems and maintain your momentum throughout; what might appear impossible to decode becomes comprehensible with some work, even if only trial and error. This concept of momentum and progress is of paramount importance on geometry problems, which comprise 15-20% of GRE Quant problems, on average. For this problem, perhaps you will come up with an approach we don’t consider! Let’s start by considering what you could do if you’re truly out of time and need to get a response down before the buzzer. Size up the problem. See what it’s asking for: area of a circle inside a triangle. You know the area of a circle is πr², so you’re on the lookout for π in the answers. It’s got to be C, D, or E. Look at the dimensions of the triangle: 8, 6, and 10. Given that π ≈ 3.14, answer choice (C) appears perhaps too small. Choose between (D) and (E) and move on either to end the section or to another problem that you are more confident you can answer. This “choose-your-battles” strategy and multiple pass approach is essential for success on GRE Quant (and Verbal). For many GRE Quant problems there is a happy median between educated guesses and laborious textbook approaches. This “Problem Solving” approach involves some math but mostly relies on your analysis and ability to make inferences from the information provided, without going through lengthy and time-consuming algebra or calculations. On our scratch paper we write down the relevant formulas we’ll need based on the question. Identify the missing information you’d like to know: the radius of the circle. Approach the problem step-by-step. What can we calculate so far? Not the area of the circle yet, but we can get the area of the triangle. How could this help us? Yes! We’re having trouble getting the radius, but it doesn’t matter. Since we know the triangle has an area of 24 and since we can estimate the circle’s area must be around half the area of the triangle, we could guess that the circle has an area around 10-14. The only answer choice that hits that range is (E). The rest are too small. This is the correct answer. In fact, nothing more is necessary. Through deduction, good analysis, and observation, we have done sufficient work to know the answer with complete certainty. There is always at least one conventional math solution to every GRE problem. Let’s take a look at what one such solution might be for this problem. We have our basic work down on our scratch paper—our formulas, a diagram, A–E for the answer choices—and now we wish to do what’s necessary to find the radius of the circle. Let’s depict the radii of this circle by drawing lines perpendicular to the sides of the triangle converging in the center of the circle. These perpendicular line segments form right angles at the intersection with the sides of the triangle. What does that tell us? These equal angles are important because they indicate that the sides opposite must be congruent. In addition, we notice that the bottom left two radii form a square. The sides of the square are all 2, and this is also the radius of the circle. Returning to our original equation A = πr², we get A = π∙2² = 4π. That’s a Lot of Work for One Problem! While this might seem like “overkill” for one GRE Quant problem, this multiple approach process is a remarkable method to increase both your proficiency with the math and aptitude at recognizing common Quant problem structures. Once you become familiar with the basic templates and style of GRE problems, your speed and accuracy will improve. Above all, never feel like you’re totally stuck or out of options. If one approach isn’t working, move on immediately either to another approach or make an educated guess and move on. Your mission is to earn as many points as possible on this test, by any means necessary. If you have questions or an alternative approach you wish to share, please comment below. 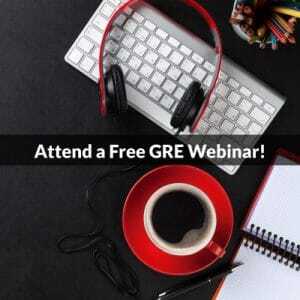 We also encourage you to register and join our free GRE and Grad School Admissions Forums, where you will receive expert answers to all your questions. Lastly, we have just announced our next GRE Webinar, scheduled to be held the evening of August 30. Register now and attend for free!